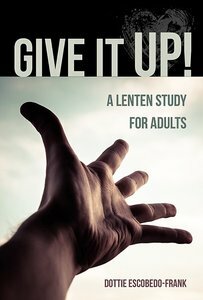 This Lenten study reflects on all the things that hold our attention, occupy our minds and monopolize our time, yet still isolate us from God and the world around us. Things like social media, phones, the noise of life, and focus on the external. Imagine taking on the challenge of giving up each of these for a week. During this seven-week study, Dottie Escobedo Frank takes the reader on a journey of self discovery, where he or she learns that the power of release brings great gain. The biggest gain is a stronger relationship with Christ. In the release, each person is freed to "give it up" in applause and praise for a life deeply lived in Christ. This thematic Bible study is designed to be used by individuals and small groups during the Lent 2015 season. In addition to the main content, each chapter offers questions for reflection and discussion, a brief prayer, and a focus for the week. The focus emerges from the chapter content and encourages readers to engage in a spiritual practice or do something specific that will help them grow in faith. On the whole, this thematic seasonal Bible study series is designed for transformation and application of Bible study to everyday, practical life experience.